Tenby is a very well known and popular sea side town in Pembrokeshire with lots of local shops, pubs, narrow streets and loads of history. The town is blessed with two long beaches and a quaint, working harbour, surrounded by brightly coloured houses. Tenby's beaches rival anywhere in the world - when the sun's out! 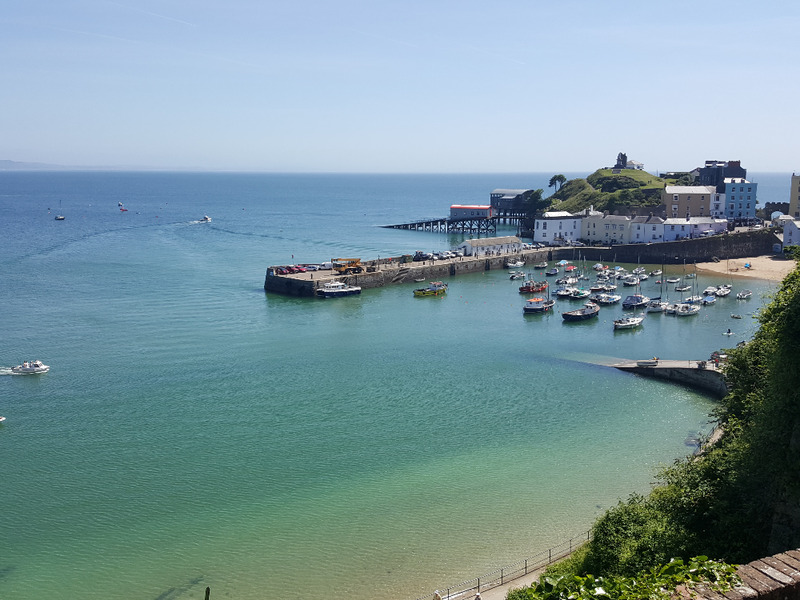 Tenby is the home of two major events in the Triathlon calendar: Long Course Weekend, which takes place in July each year and Iron Man Wales, which takes place in September. The events are extremely well organised and draw thousands of competitors and tens of thousands of spectators. They are a spectacular sight to see, both from a competitor's and spectator's perspective. The town itself dates from the Norman times, as can be seen by its castle overlooking the ocean. It also has a Napoleonic fortress, fine Georgian architecture, a restored 15th century merchant's house, a Norman church and numerous old pubs. 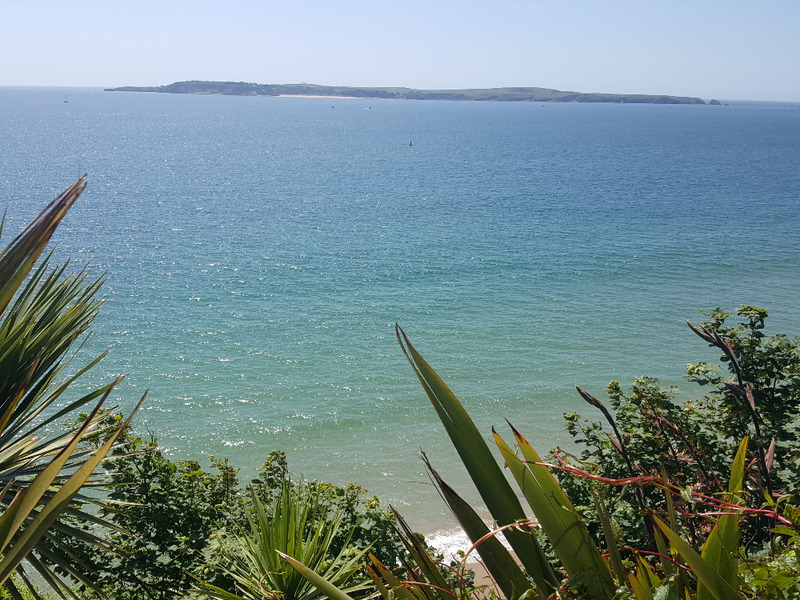 The other popular event that takes place in the summer every year at Tenby is the Caldey Island Swim, a well organised event with about 100 available swim places from Caldey Island (pictured below) to Tenby North Beach. Tenby is famous for the Long Course Weekend (LCW) and Iron Man Wales events, which attract tens of thousands of visitors every year. The iconic Iron Man sea swim leg starts on North Beach where we will walk you through the entire process: from the start point, various race strategies, logistics, route and distances, and then we will swim the route itself. It's up to you whether you do half or full distance. We're qualified open water swimming coaches so the course can be used for timing, swim drills, endurance training or a bit of everything. This route is perfect for those who have entered the Iron Man or Long Course Weekend events and who would like to get some practise in and speak to people who have done it! This is a standard beach swim along Tenby's South Beach. This swim is good for beginners and those who just want to get some distance in, or more advanced swimmers who want to do distance/speed work and drills with our fully qualified and experienced open water swim coaches. Starting on the beach we will take you out about 100m then swim parallel to the beach, turn around and come back. This swim is ideal for practising drills and beach starts. The Caldey Island Swim is a popular annual event in Pembrokeshire. 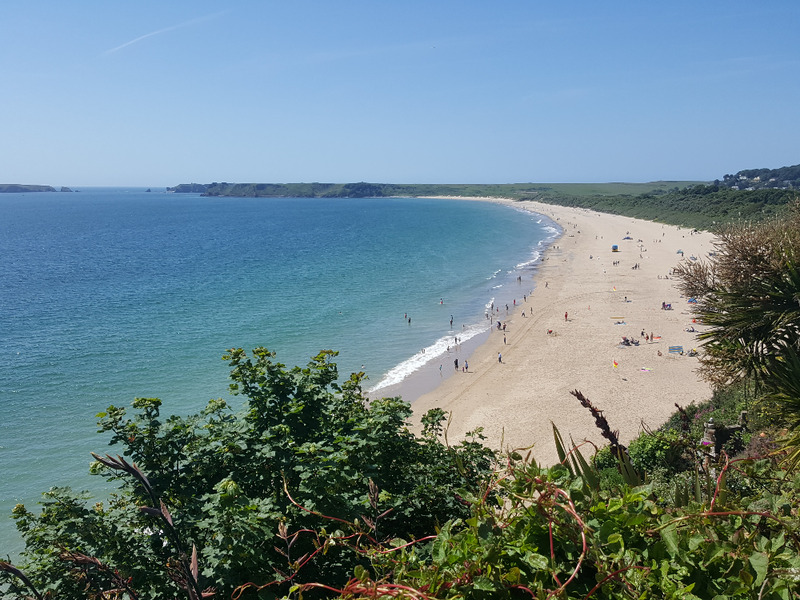 The route starts on Caldey island and goes stright to Tenby South Beach then runs perpendicular to the beach, around St. Catherine's Rock and into Tenby North Beach. It's held at specific times in August to minimise risk of strong tides and bad weather, the current between the mainland and the island is accelerated through a narrow channel and the last thing you want is to be taken off out to sea. We can arrange participation in this event as well as accompany you on the swim if needed, but numbers are restricted so please tell us by the end of May if you would like to arrange a swim. Tenby is a safe bay to swim in but it is a working area and the harbour should be avoided. Also there is a life boat ramp at Tenby so of course swimmers should avoid swimming around this area. Care should be taken at all times because of the boat traffic in the summer. You will also encounter jellyfish in the jellyfish season, which is approximately April to July. There is ample parking in Tenby although it is commonly short term so check the ticket durations. There is a multi storey car park in the town centre next to Sainsbury's that has long term parking at good rates. There are no 'changing rooms' on the beach so sea swimmers will need to get changed by their cars and carry their gear, or get changed on the beach which is probably the best option as long as you can leave your valuables with someone or take them with you in a float with a watertight compartment. There are loads of places to get snacks and food such as cafes, restaurants and pubs. You will not be hard pushed to get food and drink here! There are public toilets at the beaches. Dogs are NOT allowed on any Tenby beaches from April to October. Standard list of sea swimming equipment applies, click here for more details. You may come across some jelly fish during the spring, but are not likely to encounter much more than that. 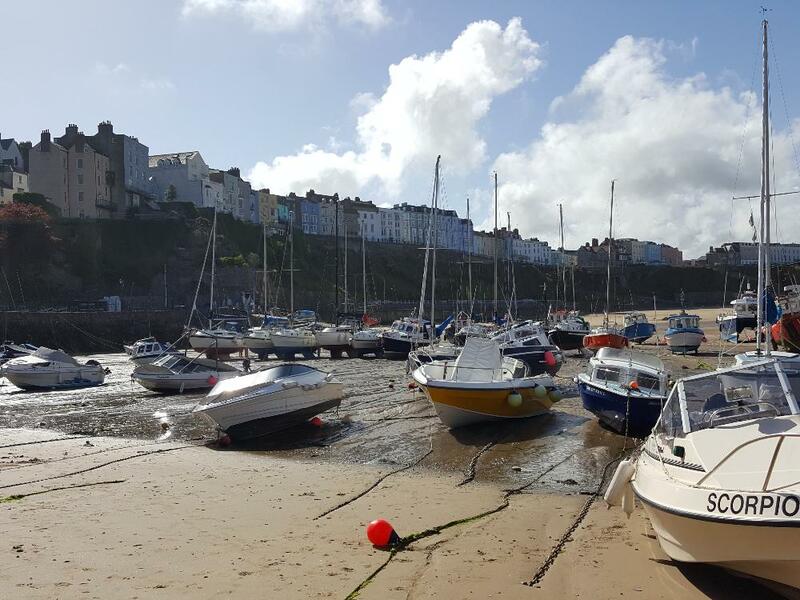 Tenby is a popular mackerel fishing destination but they are fairly far out at sea, however be careful of all of the fishing boats. You may see other bottom dwelling fish when swimming close to shore and the usual sea gulls abound here, which can be rather aggressive when on the beach - take care when eating! Book Your Tenby Sea Swim! 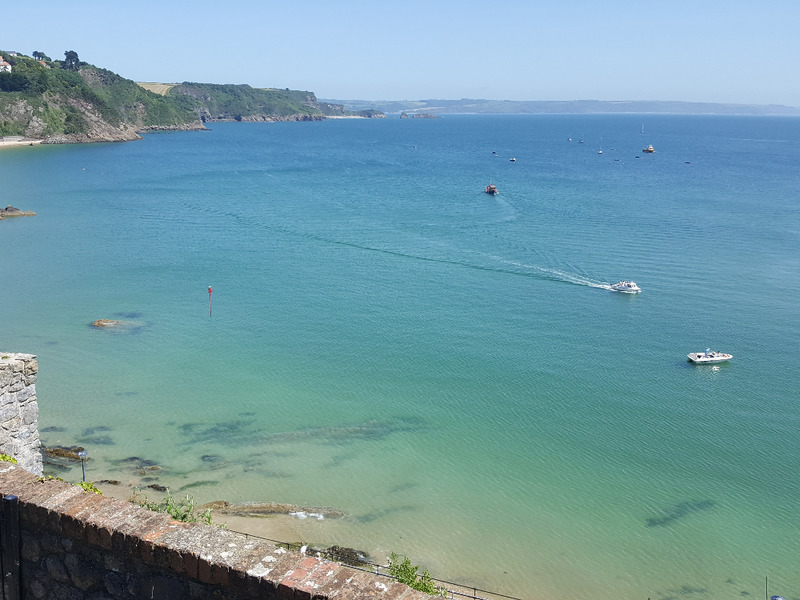 Click here to book your sea swim in Tenby now.